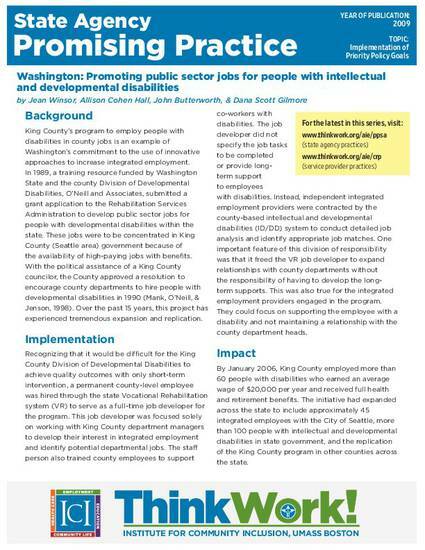 King County’s program to employ people with disabilities in county jobs is an example of Washington’s commitment to the use of innovative approaches to increase integrated employment. In 1989, a training resource funded by Washington State and the county Division of Developmental Disabilities, O’Neill and Associates, submitted a grant application to the Rehabilitation Services Administration to develop public sector jobs for people with developmental disabilities within the state. These jobs were to be concentrated in King County (Seattle area) government because of the availability of high-paying jobs with benefits. With the political assistance of a King County councilor, the County approved a resolution to encourage county departments to hire people with developmental disabilities in 1990 (Mank, O’Neill, & Jenson, 1998). Over the past 15 years, this project has experienced tremendous expansion and replication.